Cleanroom manufacturing is a high maintenance operation that can become a problem within a business. Glo Germ can help maintain a clean room process and train employees on the need for high standards. Glo Germ can teach the importance of gloves, glasses, masks, gowns, and other PPE (personal protective equipment). "For teaching simple hand washing lessons"
"Big enough for "many lessons, but not overkill"
"Orange is the new pink... even in infection control"
"You got the whole world in your hands... for a handling washing lesson anyway"
NEW Glo Germ Gel Kit! 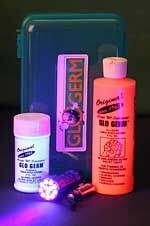 NEW Glo Germ Oil Kit!